I guess Seth Swirsky is gonna have to get another autograph on his ball. Eric Bruntlett, of the Phillies, completed the Majors 15th unassisted triple pay today. He even did it in style as it was a game ending walk-off triple play. Check out this video of the event. I really feel our pitching is fine. It's the offense that needs to get going again. 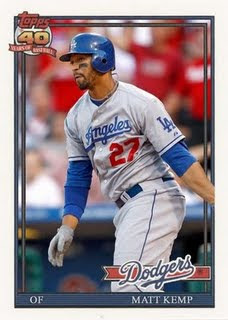 Check out this great custom card of Matt Kemp on a 1991 Topps Baseball design at Goose Joak. Also, check out this blog dedicated solely to homemade cards called the Custom Card Blog. Bob Lemke has a blog. Check it out. He is a giant in the hobby and a editor of the Standard Catalog of Baseball Cards. Nice pull! 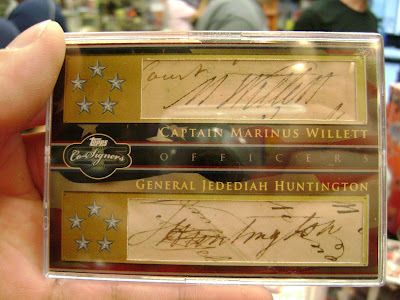 Beckett tells us about a rare 1of1 dual cut signature card recently pulled out of a box of 2008 Topps Co-Signers Baseball featuring Marinus Willett, a captain during the Revolutionary War and notably New York City’s first Mayor, and Jedidiah Huntington, a brigadier general during the war. These historical cards and signatures in Baseball packs is pretty cool. Night Owl Cards puts together the Baseball All-Dog Nickname Team. Football- celebrity look alike's from NFLJuice.com. 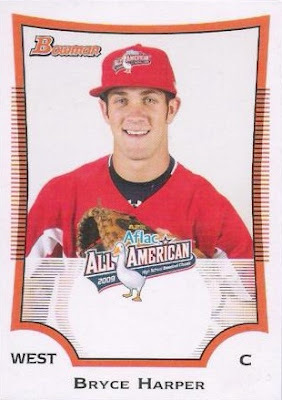 Bryce Harper, the teenage phenom from Las Vegas who plans to drop out of high school in hopes of entering the draft early, has a Baseball card from the AFLAC All-American Baseball Classic held in San Diego recently.